sold in 1947 to the French Goverment, for the Standard Francaise des Petroles as seen here "Gravenchon". The Miramar Ship Index for "SEDAN"
M.C.M. Cement Mngt Corp SA. GRAVENCHON (1947) - ESSO FRANCE ( I ) (1947-1954) -ESSO FLANDRE ( I ) (1954 -1960) F.P.V.X. T2-tanker. 10296 g. 6300 n. 16653 d.; 159.56 oa-153.31pp x 20.74 x 11.96 meters (9.19 draught). 03.1945 : completed by Sun Shipbuilding and Dry Dock Co. (462), Chester as SEDAN for U.S. War Shipping Administration. 1946 : released to U.S. Maritime Commission. 06.1947 : purchased by French Government (Standard Française des Petroles), Le Havre, and renamed GRAVENCHON. 10.1947 : renamed ESSO FRANCE (I). 1952 : owner restyled as Esso-Standard SAF. 1960 : sold to Lancer Shipping Co. Ltd., Greece and renamed PHEAX. Converted at Hoboken in a bulk carrier (15574 g.). 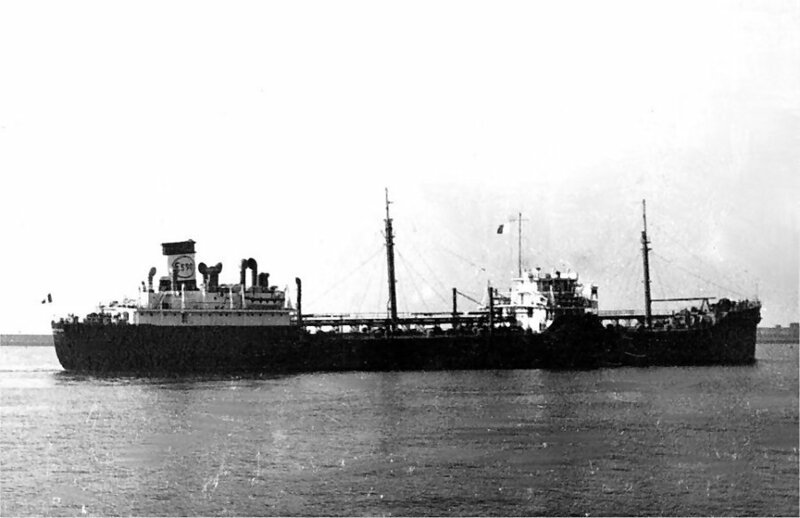 1977 : sold to Marine Cement Mgt S.A., Corp., Panama and renamed AL KHAZAN. 1978 ; sold to Duarf International Inc., Liberia and renamed CHIOS FLAG. 05.1975 : laid up in Piraeus harbour. making only the one voyage to the breakers as CHIOS FLAG.